James Longstreet was born in Edgefield District, South Carolina, on January 8, 1821. He was the fifth child and third son of James and Mary Ann Dent Longstreet. Longstreet's parents owned a cotton plantation in northeast Georgia. When Longstreet was a boy, his father nicknamed him "Pete." After Longstreet's father died in 1833, his mother moved the family to Alabama. Longstreet spent some of his youth living with his uncle's family in Augusta, Georgia, where he attended the prestigious Richmond County Academy. In 1838, Longstreet received an appointment to the United States Military Academy, where he was not an outstanding student, graduating fifty-fourth out of fifty-six cadets in his class in 1842. After graduating from West Point, Longstreet was brevetted as a second lieutenant and was assigned to the 4th U.S. Infantry on July 1, 1842.He then spent four years in the West, before serving with the 8th U.S. Infantry in the Mexican-American War (1846–1848).While in Mexico, Longstreet was promoted to first lieutenant on February 23, 1847, and he was also brevetted to captain and major. On September 13, 1847, Longstreet was wounded in the thigh at the Battle of Chapultepec. After the Mexican-American War, Longstreet returned to duty at various places in the West. On March 8, 1848, Longstreet married Maria Louisa Garland in Lynchburg, Virginia. The same year, Longstreet participated in the wedding of his fourth cousin to his West Point friend, Ulysses S. Grant. Longstreet was promoted to captain on December 7, 1852 and to major on July 19, 1858. When the Civil War erupted, Longstreet was serving as a paymaster in Albuquerque, New Mexico. He resigned his commission in the United States Army on June 1, 1861 and returned to Alabama, where he offered his services to the Confederacy. He was commissioned as a brigadier general in the Confederate Army on June 25, 1861 (dating to June 17). A few weeks later, he and his brigade played a minor role in the Confederate victory at the Battle of Bull Run I, in Virginia, (July 21, 1861). On October 7, 1861, Longstreet was promoted to major general and assumed command of a division of the Army of Northern Virginia. During the spring and summer of 1862, Longstreet served under General Joseph Johnston and then Robert E. Lee during Union General George McClellan's Peninsula Campaign in Virginia. Although he did not perform well at the Battle of Seven Pines (May 31, 1862–June 1, 1862), Longstreet was instrumental in Lee's victories during the Seven Days Battles (June 25–July 1, 1862).When Lee turned his attention to General John Pope's Union army later in the year, Longstreet's forces delivered a crushing flank attack at the Battle of Bull Run II (August 28–30, 1862). In September, Longstreet's troops held their part of the Confederate defensive line in the face of a much larger Union force at the Battle of Antietam, in Maryland, (September 17, 1862). On October 9, 1862, at Lee's request, the Confederate government promoted Longstreet to lieutenant general. One day later, the government promoted Stonewall Jackson to the same rank. Lee deliberately set the date of Longstreet's promotion one day ahead of Jackson's, thereby making Longstreet his senior corps commander. To Lee, Longstreet was his "Old War-Horse. In November, Lee reorganized the Army of Northern Virginia, placing Longstreet in charge of the 1st Corps and Jackson in charge of the 2nd Corps. Later that year, Longstreet's corps repulsed Union assaults against the heights of Fredericksburg, Virginia, during the Confederate victory at the Battle of Fredericksburg (December 11–15, 1862). In the spring of 1863, Lee detached Longstreet from the Army of Northern Virginia and sent him, along with two divisions, to protect threatened ports in the Carolinas, causing Longstreet to miss the Battle of Chancellorsville, Virginia (April 30–May 6, 1863). Longstreet returned to the Army of Northern Virginia in time to participate in Lee's second invasion of the North in June and July 1863. As second in command at the Battle of Gettysburg, Pennsylvania, Longstreet opposed Robert E. Lee's decision to attack General George Meade's well-positioned Army of the Potomac. Instead he favored maneuvering around the Federals, forcing them to fight on ground more favorable to the Rebels. Some of Longstreet's contemporaries, along with later historians and adherents of the Confederate "Lost Cause" doctrine, maintain that Longstreet's misgivings about Lee's battle plan affected his performance at Gettysburg. They contend that Longstreet was dilatory in initiating the assault Lee planned for the second day of battle, setting the stage for the disastrous Confederate defeat on the third day. Arguments about Longstreet's performance at Gettysburg have continued to rage for nearly 150 years. On September 5, 1863, Longstreet led a large detachment from the Army of Northern Virginia west to reinforce Braxton Bragg's Army of Tennessee near Chattanooga, Tennessee. Longstreet arrived just in time to contribute to one of the greatest Confederate victories of the Civil War at the Battle of Chickamauga, Georgia (September 19–20, 1863). Nevertheless, Bragg's failure to support Longstreet's rout of the Union army created a rift between the two generals. Confederate President Jefferson Davis resolved the conflict by sending Longstreet's detachment north in the autumn of 1863 to defeat Union General Ambrose Burnside's army and capture the city of Knoxville, Tennessee. Longstreet was unable to do either. After a failed siege of Knoxville, Longstreet moved his troops east and established winter quarters in western Virginia. In 1864, Longstreet rejoined the Army of Northern Virginia as his old friend, Union General Ulysses S. Grant, launched his Overland Campaign in Virginia. On May 6, 1864, during the Battle of the Wilderness, Longstreet was severely wounded in the neck and right shoulder by friendly fire, only a few miles from where Stonewall Jackson suffered the same fate a year earlier. Unlike Jackson, Longstreet survived his wounds and returned to action in time to participate in the Appomattox Campaign in Virginia. Longstreet was present when Robert E. Lee surrendered to Ulysses S. Grant at Appomattox Court House on April 9, 1865. After the Civil War, Longstreet first settled in New Orleans, Louisiana, where he co-owned the Longstreet, Owen & Company, a cotton brokerage firm, and he served as president of the Great Southern and Western Fire, Marine and Accident Insurance Company. 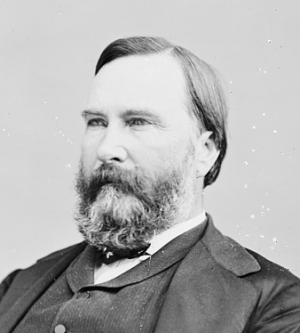 In 1867, Longstreet authored two published letters supporting African-American suffrage and acceptance of Federal Reconstruction laws, which earned him the enmity of many Southerners. In 1868, he joined the Republican Party and supported his old friend Ulysses Grant for the presidency, alienating him even further from the Southern majority. In 1870, Longstreet was appointed Adjutant General of the State of Louisiana. Two years later, he was commissioned as a brigadier general in the Louisiana State Militia. As head of the militia and state police force in New Orleans, Longstreet was shot and held prisoner by white supremacists during the Battle of Liberty Place, an attempt to overthrow the government of Louisiana on September 14, 1874. Longstreet moved from New Orleans to Gainesville, Georgia in 1875, where he purchased the Piedmont Hotel, as well as a farm outside of town. In 1877, he converted to Catholicism. From 1878 to 1879, Longstreet served as deputy collector of internal revenue in Georgia, and later as postmaster of Gainesville. In 1880, ex-President Grant used his influence to have President Hayes appoint Longstreet as ambassador to the Ottoman Empire. In 1881, Longstreet was appointed as U.S. Marshal for Georgia, a position he held until 1884, when charges of corruption involving deputies led to his removal. Longstreet's wife of forty-one years, Maria Louisa Garland Longstreet, died on December 29, 1889. For the next few years, Longstreet worked on his memoirs, From Manassas to Appomattox, which were published in 1896. In that work, Longstreet responded to the Lost Cause critics of his performance at Gettysburg. On September 8, 1897, at seventy-six years of age, James Longstreet married his second wife, thirty-four-year-old Helen Dortch. Longstreet spent the last few years of his life defending his military reputation and attending Civil War reunions where he has warmly received despite the accusations of his critics. James Longstreet died from pneumonia on January 2, 1904, at Gainesville, Georgia. He was buried at Alta Vista Cemetery, in Gainesville, on January 6, 1904.